In the examples for Some OAUTH2 walkthroughs, I used the Google CloudVision API to demonstrate various authentication scenarios. The result was an evolving webapp which could do some cool things applying that API to images. I thought it might be fun to expand it a little to do the same thing using Microsoft's project oxford vision API, which has many similar capabilities. All the code for this is on Github and is a development of the examples shown in Some OAUTH2 walkthroughs. I'm not going to dig into the code too much in this post. You are welcome to take a look and play around with it yourself. Project Oxford provides an API key, but it took me on a complex trip to sign up to a free Azure trial first (which I think is mandatory but I'm not 100% sure as things didn't go that smoothly). You need to pay for both APIS, but there is a free tier. I had to provide my credit card to sign up for Azure. Both have similar capabilities such as image classification, face detection and emotion detection. I'm going to focus on emotion detection in this post, since it presupposes the others. There's a video version of this post here. The Google one allows you to do more things at once, but the result is that it's more complicated to use. 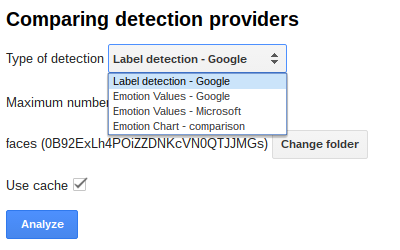 It also returns categorized emotional scores, whereas Microsoft sticks its neck out and gives you an actual value. 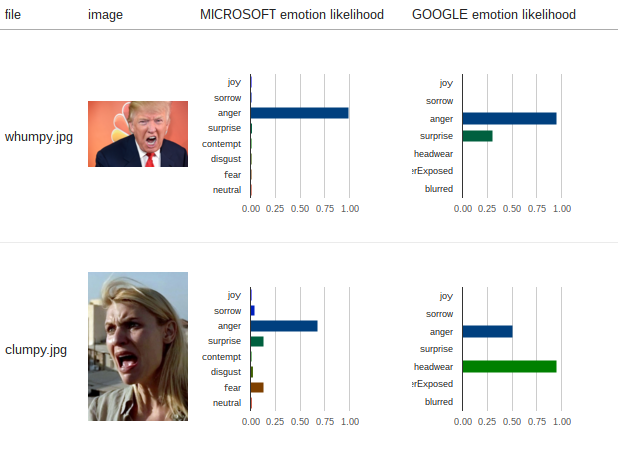 Microsoft is also more ambitious in its emotional analysis range, attempting to detect more subtle emotions. Although neither are perfect, I think the Microsoft one gives more balanced and subtle results, and its easier to use. So for once, it's Microsoft for me. Let me know what you think from the examples below. Before I get into the details, here are the side by side results of emotion analysis on a couple of images. The emotions detected (they are called slightly different things, but I've normalized them for comparison), are a little different. Both detect joy, sorrow, anger and surprise, but Microsoft go a little further and try to look for contempt, disgust, fear and neutrality. Google offer some functional type measures such as headwear detection, underexposed and blurred. So that I could compare them as a chart, I assigned these weights to the categorizations. Let's take a look at a few more comparisons. Google (on the right) got this one completely wrong - Bernie doesn't look too happy to me in this picture. He looks angry and somewhat disgusted - Microsoft got it right. Google did better in this one, capturing both the surprise and anger in this Trump image. I love this photo, which is 100% joy, recognized by both. Strangely, Google didn't detect she was wearing a hat. There really isn't a category to describe this dopey image of Francois Hollande, but they both concluded he was happy, with Microsoft throwing in some surprise. Both did well in this Hillary image, picking up both the surprise and joy. I've covered Google label detection in other posts in Some OAUTH2 walkthroughs, but it's interesting that Google certainly likes to detect hair or headwear. even giving first classification of hair to Trump when he's wearing a hat. I haven't tried Microsoft label detection. Face detection is of course a pre-cursor to being able to analyze emotion. The Google face detection and emotion detection are wrapped up - both are returned from the same query. Microsoft has a separate api call for each. Since the main purpose of this app was about authentication scenarios, it's a bit rough for a finished app. For example it will not handle cases where no emotion can be detected, nor with multiple faces in the same photo, so make sure your folder contains images appropriate for the type of analysis being done. If you decide to use the code and enhance it, I'd love to host your write up in my guest post section of this site. Please let me know if you'd like to do this. This is what has been implemented in the app as it stands today. I would recommend you always use cache, since this avoids a call to the API. It will be faster, and might avoid some charges. Google allows you to send multiple queries in one request, whereas Microsoft needs a query for each request. I've cached each result separately , so the only queries that are actually made are for new or changed images (or if cache has expired for that image). I've covered this a number of times in Some OAUTH2 walkthroughs, and all flavors of that are in this example. Once you have your credentials create and run a one off function that looks like this, substituting your credentials and ids as appropriate. msEmotionKey:'e9xxxxxxxxxab2' // you can store arbirary properties in goa too. You should put the images you want to analyze in a folder and select it in the App. I put a limit on the number of images it will analyze to avoid accidentally generating potential charges. You'll find that maxFiles property in the Cloudvision namespace.